1.Preheat oven to 375 degrees F. In a large bowl, toss together sugar, tapioca, blueberries, and orange juice. 2.Unroll 1 pie crust on a well-floured surface. Fit over bottom of a 9-inch deep-dish pie plate. Spoon blueberry filling into crust and place second pie crust on top of filling. Pinch edges together to form a tight seal and decorative trim. With a knife, cut 5 or 6 small slits into crust. 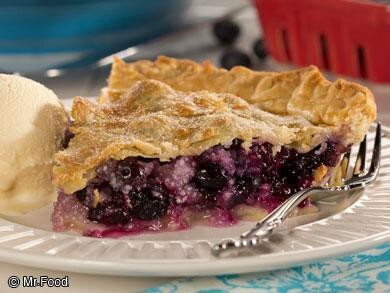 Brush pie with egg and milk wash. 3.Place pie on a baking sheet and bake 45 to 50 minutes, or until blueberry filling is bubbly and the crust is golden. Let cool before serving.